The brake system on your vehicle is essential to your safety, and the safety of everyone else on the road. 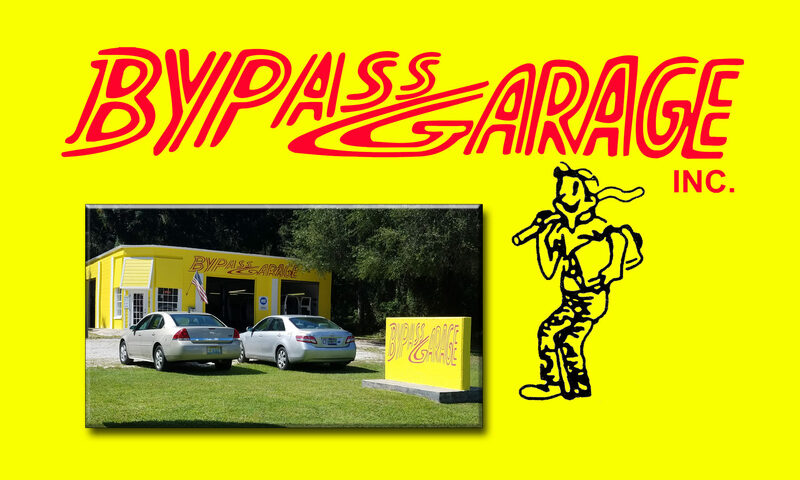 We take great pride in the work we do here at the Bypass Garage…especially when it comes to your safety and the safety of others. Brakes, like any other wear item, have a limited lifespan. Under normal conditions, you should be able to get about 40,000 miles from a set of pads. Sometimes there may be another issue that can wear them out prematurely. Also, there is much more to a brake system than just pads and rotors. Click here for more information. 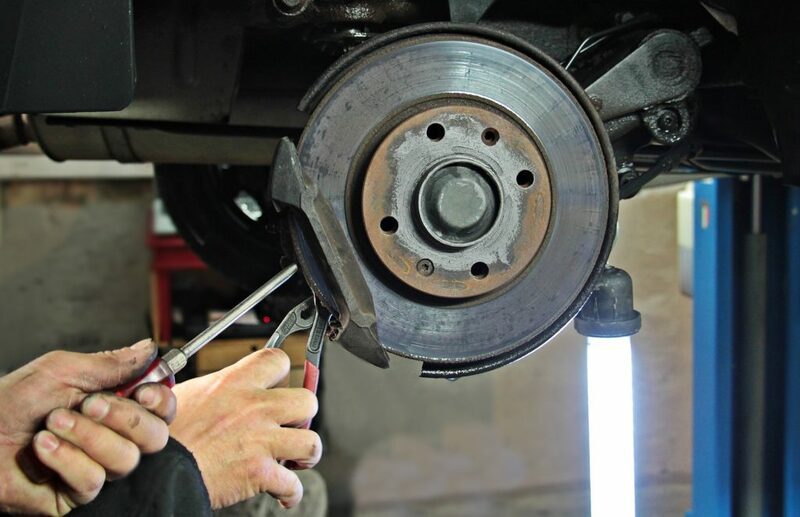 Having your brakes checked out periodically is always a great idea! All this month, we are offering a FREE brake inspection as our way of giving you piece of mind. Knowing there is an issue lurking is one thing…driving blind to a potentially serious safety hazard is completely another! Call us today for an appointment. The disk brake system is what most modern vehicles are using primarily. This is a hydraulic system that should be inspected regularly to ensure your safety. Disk brakes are relatively easy to understand. The diagram below will make it even easier. When the brake pedal is pushed down, a plunger inside the master cylinder forces brake fluid through a system of high-pressure tubes and hoses to each wheel’s brake. The master cylinder is usually found in the engine compartment, on the firewall on the driver’s side. The most common problem with master cylinders is an internal leak. You will notice a slow sinking of the brake pedal to the floor when this happens. If you feel this is a problem you are experiencing, come in and have us inspect your brake system today. Brake fluid is hydraulic fluid specially designed for brake systems. It will defy high temperatures without boiling, and cold temperatures without thickening. The current standard for brake fluid that has been set by the Department of Traffic is DOT-3. Brake fluid levels will drop slightly as the brake pads wear, this is normal but if fluid levels drop substantially in short period of time, you may need to have your brakes checked. Fluid cannot be compressed in a sealed system, but air can… if there is air present in the brake fluid, the brake pedal will have a sponginess effect, and braking efficiency is greatly reduced. If your brakes have this sponginess feel to the pedal, the brake system must be bled to remove air from the brake lines. This is also a good reason to have your brakes checked. Disk Brakes are used to stop everything from cars, trains to jets! Disk brakes wear longer, adjust automatically, self-clean, and resist water better than any other brake system around. The design of the disk can vary from vehicle to manufacturer. Vents or holes in the disk help to cool the disk, as heat can build up quick when the brakes are applied. When changing brake pads, it is a good idea to “turn” the brake rotor (disk). This shaves off old brake pad material left in the rotor, also puts a new surface on the rotor. Rotors can only be turned to a safe thickness of the rotor. Our technicians can inspect your brake rotors and tell you if your rotors can be turned safely, or if they need to be replaced. Price Includes Labor and Pads Only. Rotors are extra if needed.